A DTC Virtual Tour Presented by: Celani Dominguez, Ph.D. DTC, Southwest ISD Oh! the places you will go! 1 A DTC Virtual Tour Presented by: Celani Dominguez, Ph.D. DTC, Southwest ISD Oh! the places you will go! 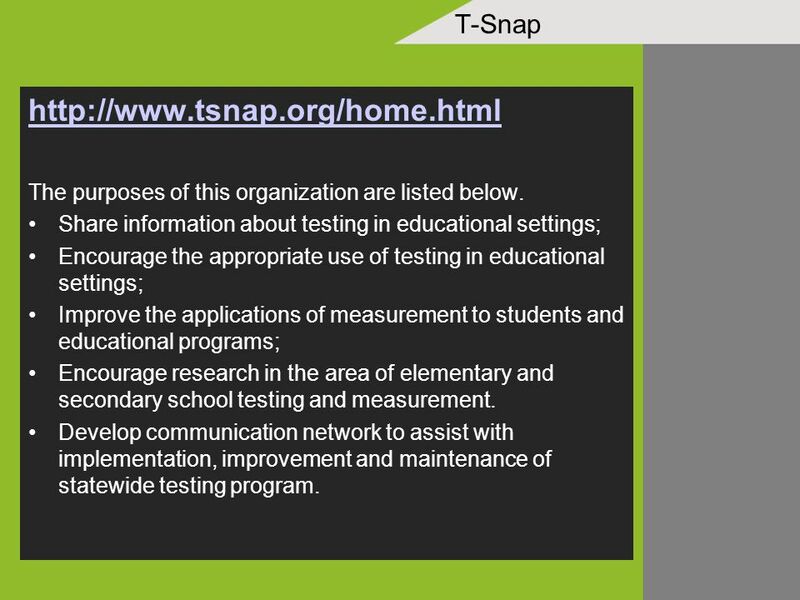 2 T-Snap http://www.tsnap.org/home.html The purposes of this organization are listed below. Share information about testing in educational settings; Encourage the appropriate use of testing in educational settings; Improve the applications of measurement to students and educational programs; Encourage research in the area of elementary and secondary school testing and measurement. Develop communication network to assist with implementation, improvement and maintenance of statewide testing program. 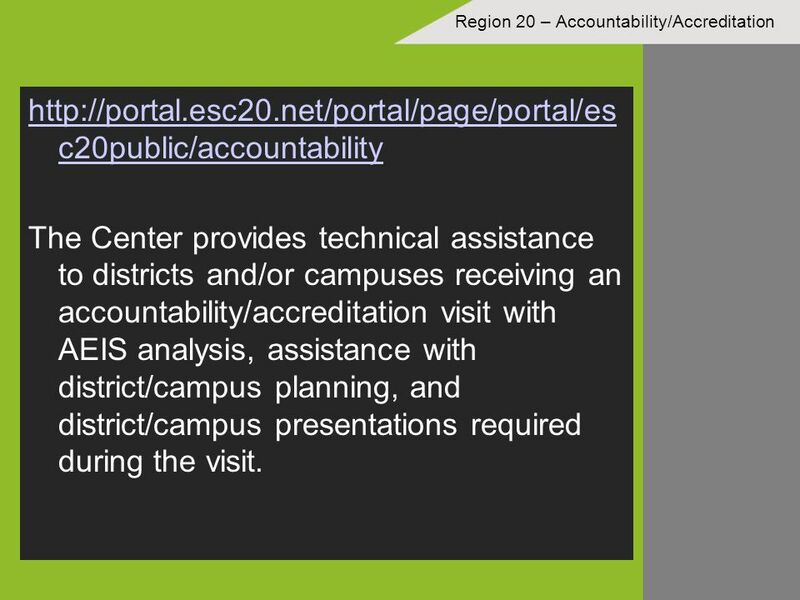 3 Region 20 – Accountability/Accreditation http://portal.esc20.net/portal/page/portal/es c20public/accountability The Center provides technical assistance to districts and/or campuses receiving an accountability/accreditation visit with AEIS analysis, assistance with district/campus planning, and district/campus presentations required during the visit. 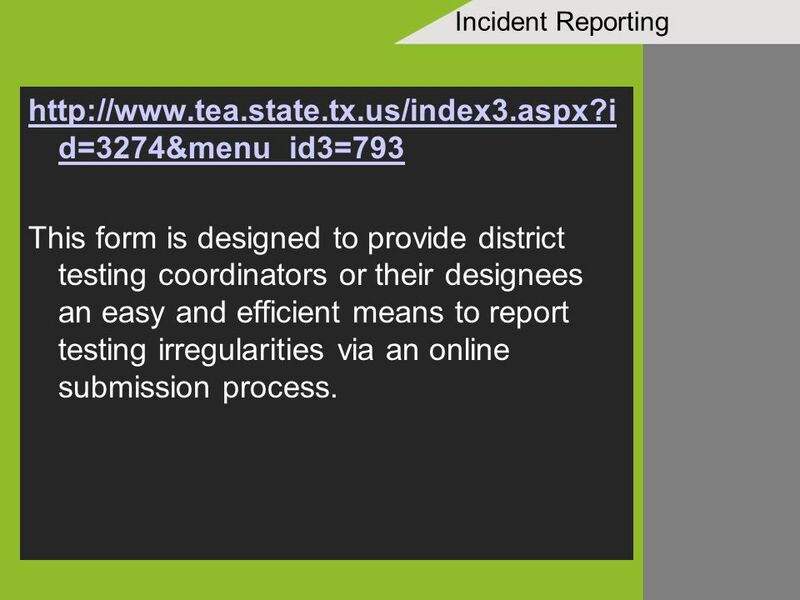 4 Incident Reporting http://www.tea.state.tx.us/index3.aspx?i d=3274&menu_id3=793 This form is designed to provide district testing coordinators or their designees an easy and efficient means to report testing irregularities via an online submission process. 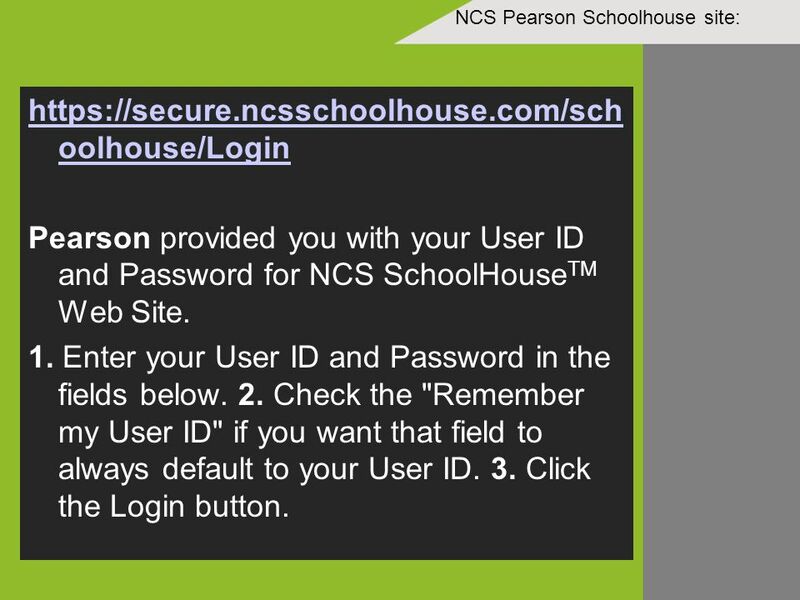 7 NCS Pearson Schoolhouse site: https://secure.ncsschoolhouse.com/sch oolhouse/Login Pearson provided you with your User ID and Password for NCS SchoolHouse TM Web Site. 1. Enter your User ID and Password in the fields below. 2. Check the "Remember my User ID" if you want that field to always default to your User ID. 3. Click the Login button. 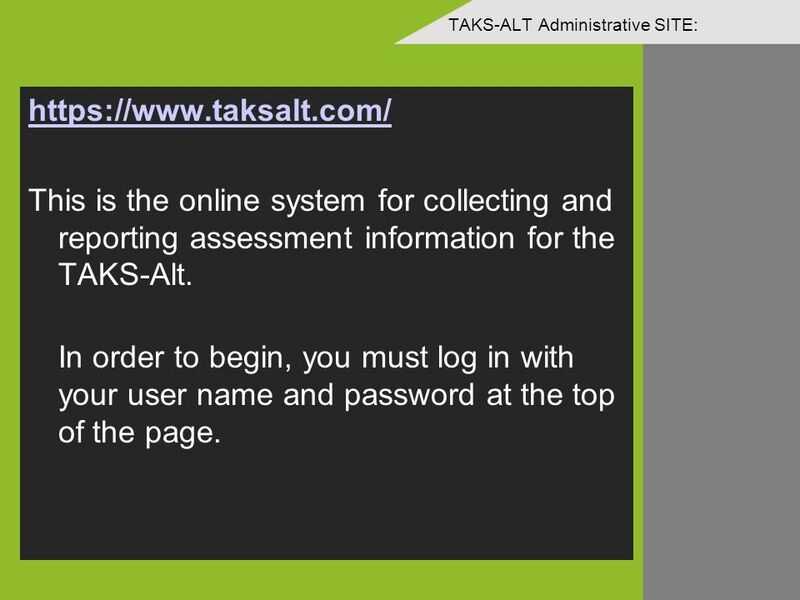 9 TAKS-ALT Administrative SITE: https://www.taksalt.com/ This is the online system for collecting and reporting assessment information for the TAKS-Alt. In order to begin, you must log in with your user name and password at the top of the page. 10 TAKS-ALT and TELPAS Training Site: https://texas.pearson.desire2learn.com/ This site currently offers access to the online training system for TELPAS raters and TAKS-Alt users. 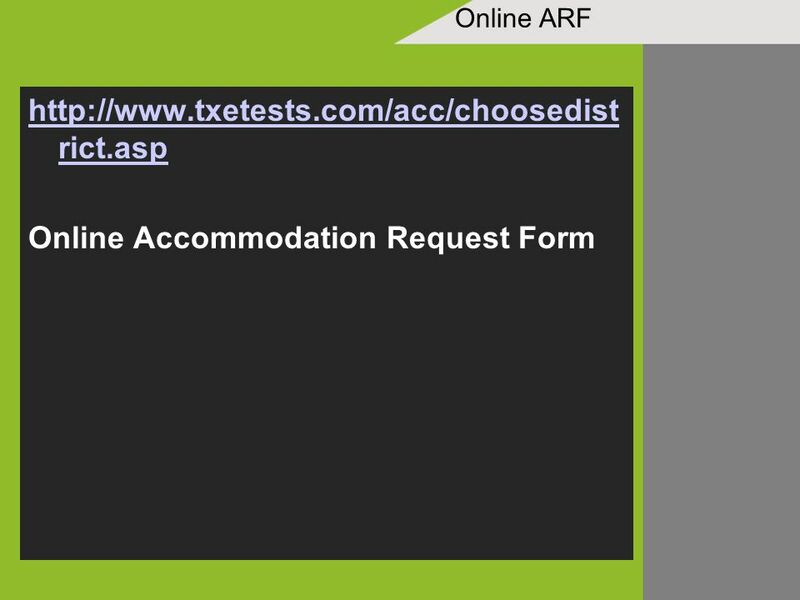 Region, district, and campus testing coordinators (or their designees) also have access to this site for their administrative use. 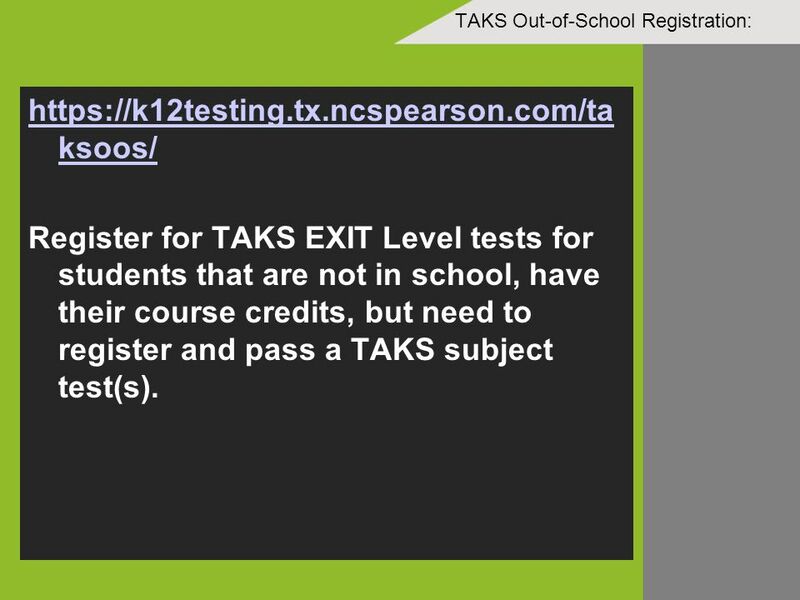 11 TAKS Out-of-School Registration: https://k12testing.tx.ncspearson.com/ta ksoos/ Register for TAKS EXIT Level tests for students that are not in school, have their course credits, but need to register and pass a TAKS subject test(s). 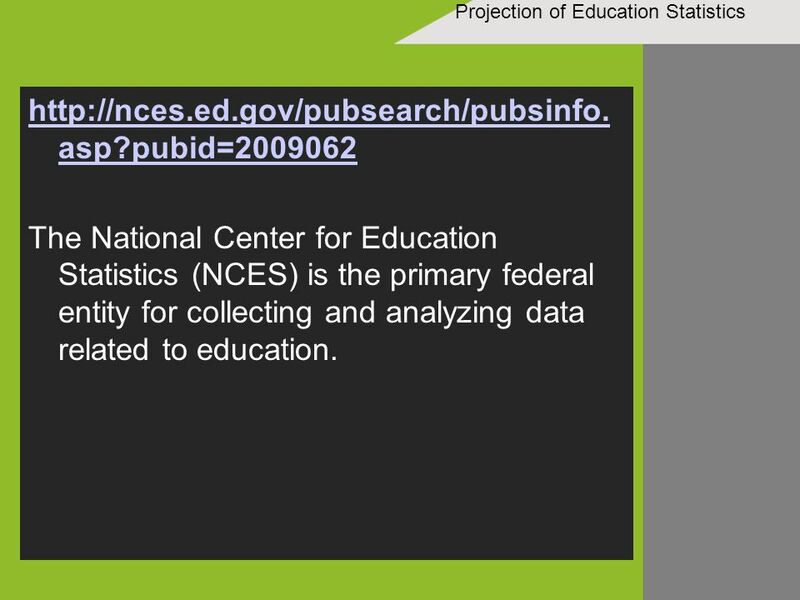 12 Projection of Education Statistics http://nces.ed.gov/pubsearch/pubsinfo. asp?pubid=2009062 The National Center for Education Statistics (NCES) is the primary federal entity for collecting and analyzing data related to education. 14 School Data Direct http://www.schooldatadirect.org/app/co ntent/q/mtype=Overview.shtml/mlvl=0 /site=pes SchoolDataDirect is an online service of the State Education Data Center. Download ppt "A DTC Virtual Tour Presented by: Celani Dominguez, Ph.D. DTC, Southwest ISD Oh! the places you will go!" Education Professional Standards Board New User Registration. Detailed Slideshow. Why is North Carolina developing Home Base? The central focus of READY is improving every students learning... …and enabling and ensuring. 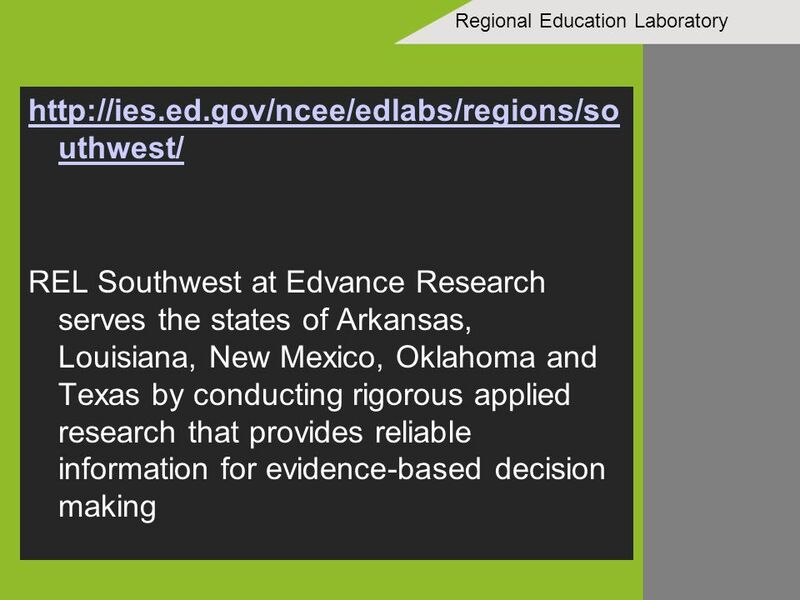 GENERAL OVERVIEW OF STEPS TO REQUEST ACCESS TO SPP INDICATOR THROUGH TEASE ( TEXAS EDUCATION AGENCY SECURE ENVIRONMENT) TEASE 1. WASS EXPRESS TUTORIAL Web Access Security System. Term ICT Coordinators Training Day Effective Use of the Internet and .